South Koreans spend very little on viewing paid content available online, with the user ratio hovering at 0.5-4.9 percent and the monthly average spending reaching 579 won ($0.51), data by the Korea Information Society Development Institute showed Wednesday. According to the KISDI report that surveyed 9,788 Koreans between May and August, the least was spent on viewing news, magazines and books, including webtoons. 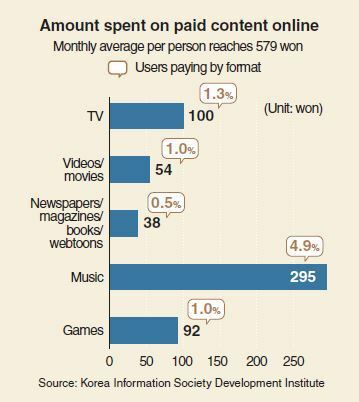 This means Koreans spend on average less than 40 won per person to read text-centered contents online. The report pointed out that as there are numerous free alternatives available online, convincing users to part with money for the content is no easy task.